African swine fever (ASF) struck the largest pig producer in the world, China, last August, and more recently found its way to Vietnam. Here in the United States, the challenge is to keep the highly contagious and deadly disease out of the country. Last week, the US Department of Agriculture (USDA)-trained detector dogs played a major role in the seizure of roughly 1 million pounds of pork smuggled from China. The USDA and Secretary Sonny Perdue is sharing information about the importance of keeping ASF out of the United States. It is vital for everyone to know about ASF and how to prevent it, while keeping the U.S. pig population healthy. Concerning educating and informing the public, they have an updated webpage dedicated to ASF. 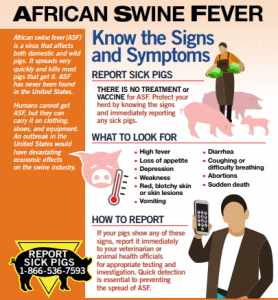 They also put out four very good infographics– African Swine Fever Risk Pathways , Signs and Symptoms of African Swine Fever , Traveler Tips and Biosecurity. Something is odd about this story. Why would anybody smuggle a million pounds of Chinese pork into the U.S.? The U.S. is among the largest pork producers and we have some of the lowest pork prices in the world. This would be like smuggling corn or coal into the U.S.